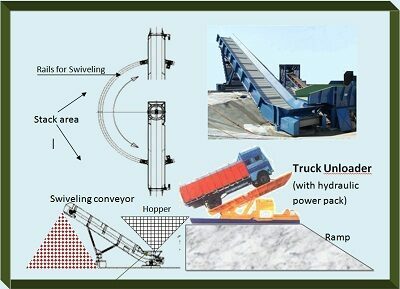 PEIE Design, Engineering, Manufacture, Supply, Erection & commissioning 2nd generation Swivel Conveyor truck Unloading system in TPM methodology with following customer delighting features. The intention of this supply is to achieve the minimum criteria for continuous unloading of material from normal truck & stacking in desired circumference. · Design & Development of flow sheet & Selection of equipments. · Manufacture, Shop test & Supply . 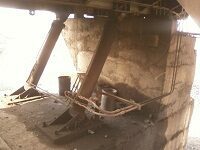 · Supervision, Fabrication, Erection & Trial run of PEIE Supplied equipments. Manual Ball Stop Valve - In case of power failure, Manual Ball Stop Valve is provided to bring down the Platform in the Horizontal position. Solenoid operated Master Relief Valve - Relief Valve is provided to operate the system in desired pressure. It ensures prevention against any damage due to over loading. Hydraulic and Electrical components capable of lifting 60 Tons at an angle of 55°, compact Power Pack with Tandem Hydraulic Pump (68 + 22 lpm) 300 Ltrs. Oil Tank, Sol. Valves, 22KW/30HP TEFC 1450 rpm Squirrel Cage 3 phases 50 cycles 440 V Induction Motor, Foundation Bolts and Control panel complete in all respects. 2 Nos. Heavy duty Hydraulic Cylinders shall be used for lifting of the tilting platform with loaded truck. 2 Nos. Hydraulic Cylinders shall be activated for raising of retractable rear stoppers. 2 Nos. Hydraulic Cylinders shall be for hook chain assembly for front hooking of the truck. All the critical Hydraulic and Electrical Components shall be totally enclosed by a protective cover to prevent dust and rainwater accumulating on these components which is a must for dusty outdoor locations where the equipment operates. Power pack consists of Pump, Motor, Oil Tank, Pressure Gauge, Temperature Gauge, Clogging Indicator, Filter, Solenoid Valves, PO Check Valves, Starters, Contactors, etc. Push Button Switches for all Hydraulic operations shall be placed on the control box, which can be placed at any convenient place for better visibility of the operation. A heavy duty centralized greasing system with hand pump and shuttle valve for easy maintenance is to be provided. While unloading, truck to be drove on ramp and placed on hydraulic operated unloader platform made from Steel frame & structure with anti–skid chequered plate is welded on the top of the frame. The unloading to be achieved by tilting the entire Truck chassis with platform by pivoting near to rear wheel axis and rotating about 500 to horizontal. Unloaded material to be collected in to a hopper and to be fed through a vibro-feeder to stockpile conveyor. 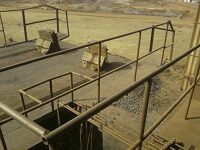 The stockpile conveyor may support on wheels guided by rail to its turn around radius 10-30M circum.